Eleven chapters from Demo to Punch List including Communication, Safety, and Understanding Language Barriers on the Job. Custom Covers are available with your company’s logo and information. Call for pricing. 500 unit minimum. eBook version. 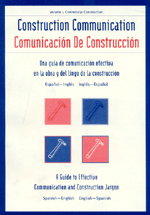 Eleven chapters from Demo to Punch List including Communication, Safety, and Understanding Language Barriers on the Job. Over 1400 words and terms used on Home, Commercial, Heavy Construction and highway Projects with tools, equipment, safety and landscaping. Custom Covers are available with your company’s logo and information. Call for pricing. 500 unit minimum. eBook version. Over 1400 words and terms used on Home, Commercial, Heavy Construction and highway Projects with tools, equipment, safety and landscaping. Over 3,600 words and terms used in the Transportation and Warehouse industries. eBook version. Over 3,600 words and terms used in the Transportation and Warehouse industries.